For the meat: In a 9x13 inch baking dish, mix the meat with the beer, garlic, seasoning salt, chile powder, black pepper and ground cumin. Cover with plastic wrap and refrigerate for at least 30-45 minutes before grilling. Grill, to taste. Carefully slice or chop the grilled meat on a cutting board. For the tacos: Heat the tortillas over low heat. Spread 2 tablespoons of refried beans on each tortilla. Add the grilled beef to the tacos. Garnish with pico de gallo and the hot sauce of your preference. Swap out corn tortillas for flour tortillas for a variation. This grilling season, prepare delicious asada tacos with grilled beef and an extra special, unexpected ingredient: beer! Marinating meat before grilling not only adds flavor, but also helps tenderize the beef. Once you've removed the beef from the grill, slice or chop it up. 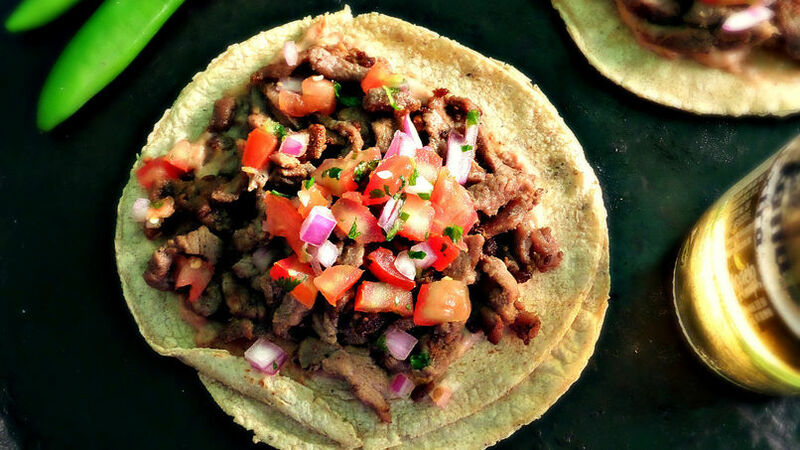 To give this taco recipe an even more authentic twist, I've add fresh pico de gallo and hot sauce for garnish.